I know I'm late to the party, but I had to add this. On Oct 2nd I was coming home from having been in the ER with my Aunt. It was about 0300 in the AM. I was on the highway, but in a rural area. I didn't have my brights on because I had met other traffic. All of a sudden there was something BIG, black & dead (not moving) in my lane. I guess I'm glad I didn't swerve, I probably would have caught a bit of it and flipped my car. As it was my 1997 Saturn SL went airborn, both air bags deployed, we hit the pavement again and I never lost control. I think a big Thank you God as I'm no stunt driver. I ended up driving on home as I was about 10-15 min from the farm. My Saturn is totaled, but still got me safely home. There is NO body damage at all. The radiator & fan, and air conditioner compressor (maybe it was condenser?) shot. I want that car FIXED! It got reliably over 40 mpg, and got me HOME! I have been playing phone tag with the insurance people, but maybe tomorrow. I bought a 2002 SC2 from a car lot, it doesn't get the milage, but I wanted another Saturn & thanks to cash for clunkers good used cars are hard to find I was told by more than one car lot. One salesman complained they so destroyed the cars taken in, they can't even be used for parts. So I felt lucky to get the car I did. 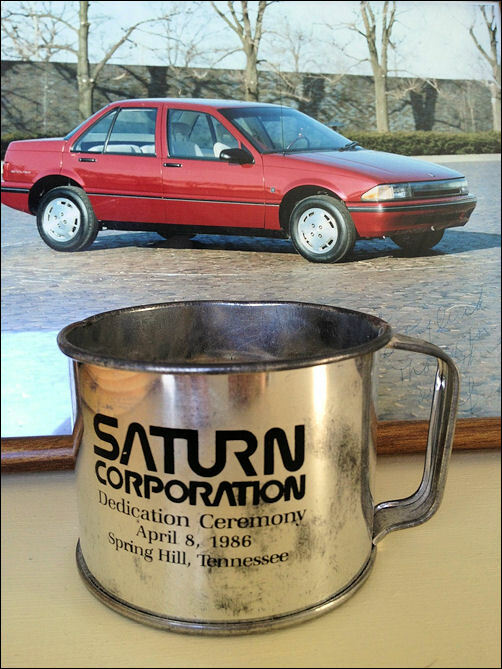 But if anyone on this board worked at making Saturns, you made the finest car ever on the road. I love my Satun, and wouldn't settle for anything less than another one. Rate the quality of this post and help savvy_cowgirl reputation points. Click the reputation button near the bottom left corner of this message box. Thank you! I loved reading through all the old articles. As long as the content was fresh it would be awesome to do it again. Rate the quality of this post and help FlintIonQC reputation points. Click the reputation button near the bottom left corner of this message box. Thank you! 2004 Ion Redline, CAI, 3" exhuast. Rate the quality of this post and help n_c_mail reputation points. Click the reputation button near the bottom left corner of this message box. Thank you! Thanks for the flood of happy memories and pride. Saturn will always have a fond place in my heart. Yes, do this reunion again, but this time, GIVE MORE NOTICE. You sent the email the day of the event. I don't always have time to check email every day, and I have multiple emails. Please given a few days notice of the event. I only got the email this morning. I own 2 saturns, I love saturns, I think they were the best cars ever made. I'll never buy a GM car because GM is the ones who discontinued the saturn and prevented the electric car from being marketed 20 years ago. Rate the quality of this post and help raymondmm reputation points. Click the reputation button near the bottom left corner of this message box. Thank you! I've posted several messages on the forum this week, but not a "testimonial". So here goes. Back in 2001, I had a new L200 5-speed. I was on Ky55 headed tward the Bluegrass parkway and came up to a shopping center entrance that had no turn lane, this was in a small town near the parkway. Several cars were stopped, planning to turn into the center. I came up behind the line and stopped. After a short while, I heard a loud crash and then I was shoved down and backwards in the seat. A 3/4 ton Ford truck had slammed into a Monte Carlo behind me and shoved it into me. My car went forward into a minivan in front of the line. The truck was severely damaged, the Monte Carlo was totalled, as was my car and the minivan had several thousand dollars of rear damage. Only the minivan driver and I didn't have any apparent injuries; the others were serious enough to be taken by ambulances to the hospital. The L200 had severe front and rear frame damage,but the passanger compartment held up and the doors would open, I think it kept me from being injured like the Monte Carlo occupants. I took the settlement and got an L300 that looked just like the totaled Saturn. I kept it for 5 years without incident. Rate the quality of this post and help sideup66 reputation points. Click the reputation button near the bottom left corner of this message box. Thank you! That's the second photo of the prototype I've seen, and I haven't seen it before now. A great find. I wonder where that car is now? I'd love to know more about it. Yes please do it again...I missed it because my iPhone couldn’t get thru the few time I had time to try!! I have a Thankful I drive a Saturn story. After a 4 hour drive I was turning in to the Funeral home, where I was suppose to finish up the paper work for my Uncle, when I pull right in front of a car (I’m sure he was going too fast and I should have waited). My father was in the passenger’s seat. My Vue took the hit and good care of both of us, my father and I were a little sore but that was it. Someone said my Vue should have been totaled but I was lucky that my insurance company didn’t agree and it was fixed (almost a brand new engine). So 7-years later Kanga, my Vue, are still together and she running fine and accident-free! Rate the quality of this post and help tiggerkanga reputation points. Click the reputation button near the bottom left corner of this message box. Thank you! Late for the fun but I had my 2003 Saturn Vue on vacation with me! I did post a new picture of my Vue on vacation if anyone wishes to see it. BTW, it turned over to 118, 550 miles and is still plugging along. As long as there are Saturn fans out there might as well keep having reunions!! Rate the quality of this post and help ColtsVue reputation points. Click the reputation button near the bottom left corner of this message box. Thank you! Sadly I wasn't able join in. I would also like a bit more advance notice. Still driving my '97 SW2 and loving it. My son, 12, asked me the other day. When I get old enough to drive, will I be able to drive this car.... What more can I say? Rate the quality of this post and help Pol reputation points. Click the reputation button near the bottom left corner of this message box. Thank you! Yes, do this reunion again, but this time, GIVE MORE NOTICE. As I just told another user, all the reminders were confined to this general forum and I believe the main site.. there were threads here about 4 days till Saturn Reunion, etc.. I took the settlement and got an L300 that looked just like the totaled Saturn. I kept it for 5 years without incident. You mean it also came with the stick shift?! Can't tell whether or not to take your post seriously or not due to the in your post icon at the top of your post..
but yeah, what service does your iPhone have (Verizon, AT&T, sprint, etc)? Most likely I'd start there or use Wi-Fi. YES!! Let's do it again. Rate the quality of this post and help Dave The Barbar reputation points. Click the reputation button near the bottom left corner of this message box. Thank you! By all means, please do it again. I had plenty of advance notice of the event and appreciate the courtesy, but the real world threw me some unexpected and unplanned surprises. My mom's VUE officially reached the 100K milestone this year. (Good thing she didn't trade for that Subie). It took me eight years to reach that mark on my dearly departed SL2. When I was part of the Amiga forum we used to do it every Sunday for several hours. Most of the Amiga owners were in the UK, so it was entertaining. Rate the quality of this post and help hoggman reputation points. Click the reputation button near the bottom left corner of this message box. Thank you! D'oh! I forgot this what happening this weekend. By all means, please do it again for as long as you're willing and there is interest. Like most on this board, I have a lot of respect for the Saturn brand. raymondmm and Pol, as shown at the end of this thread, Charlie started advertising the reunion a full month in advance, with multiple reminders. Rate the quality of this post and help jogle reputation points. Click the reputation button near the bottom left corner of this message box. Thank you!